Printable crafts for the New Year's Eve give kids something fun to do when the adults are busy dancing the night away. Additionally, children who are too young to stay up until midnight can celebrate the holiday with a crafting session that lets them keep a respectable bedtime. These crafts can also be fun for older kids and for families ringing in the new year together. 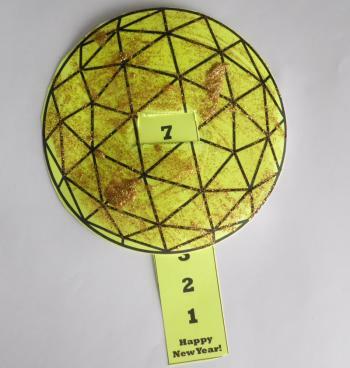 A printable countdown ball gives children a fun way to countdown to the New Year in the privacy of their own home. This is a great alternative for children who won't be able to stay up to watch the Times Square Ball drop on television and a good way to work on developing number recognition skills. Download and print the countdown ball and counter on sturdy cardstock. For download assistance, try these helpful tips. Embellish the countdown ball with glitter glue, applying with the foam paint brush. When glue is dry, have an adult make two horizontal slits in the ball where marked on the printable. Thread the counter through these slits. Adjust the counter as needed to pass the time until midnight. Depending upon your child's age and attention span, you could count down every hour, every 10 minutes, or every minute. 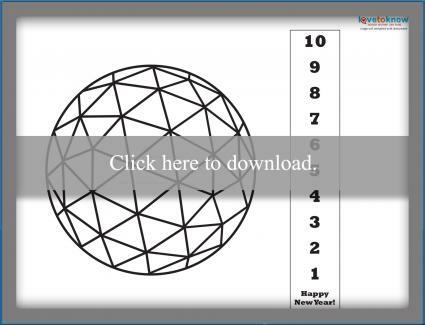 Download the printable countdown ball. No party is complete without a festive hat! These printable hats are easy to make and double as cute photo props for all your New Year's Eve pictures. 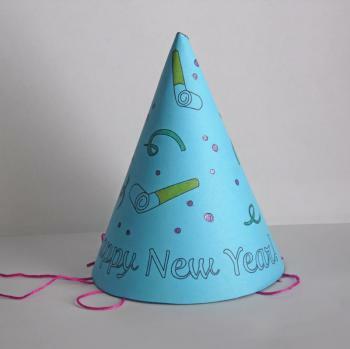 Print the party hat template on cardstock. Color as desired with crayons, markers, or colored pencils. Fold the template into a cone shape, using clear Scotch tape to secure the paper. Punch holes on opposite sides of the hat. Tie elastic cord or colored thread to each hole so the party hat will stay in place on your head. 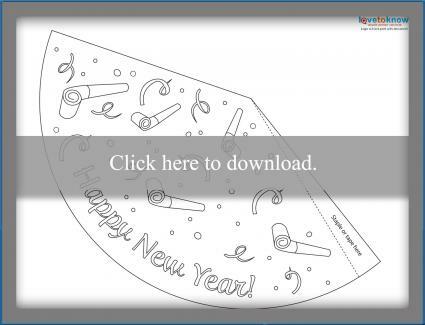 Download the printable party hat. The Chinese New Year, often called the Lunar New Year, is the most important of the traditional Chinese holidays. This holiday occurs on a different day each year due to the differences in the Chinese calendar. Celebrating the Chinese New Year can be a fun way to teach children about a different culture. Print the dragon puppet printable on cardstock. Cut out the dragon's face and tail. If you're making this project with a small child, it's easiest to cut around the shape instead of trying to cut out the smaller details. Accordion fold a long strip of colored construction paper to make the middle body of your dragon. 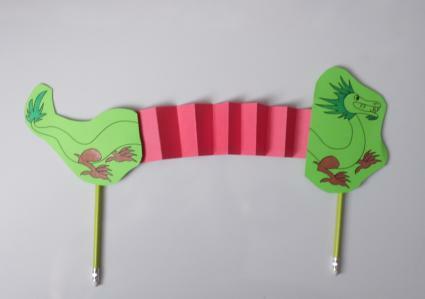 If desired, you can tape together several colors of construction paper to make a very long dragon puppet. Tape the ends of the folded strips to the back of the dragon's head and tail. Have an adult hot glue the pencils to the back of the dragon's head and tail. This gives you handles for operating your puppet. If desired, tape strips of colorful ribbon along the dragon's folded body for added visual effect. 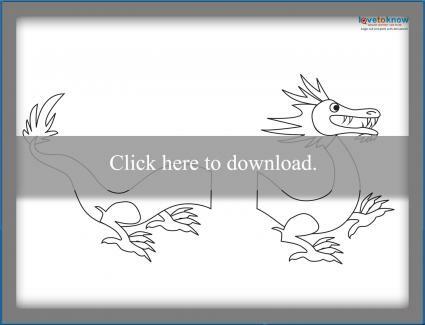 Download the printable dragon puppet. Apples for the Teacher has several New Year printable coloring pages for young children to enjoy. Use them as place mats for a party, wrapping paper for tiny gifts, or decorations for a scrapbook page documenting all the fun things your child hopes to do in the upcoming months. Enchanted Learning has templates for printable calendars that can be used to ring in the new year. Children can make calendars for their own rooms or to give to a family member as a gift for the occasion. Printable paper crafts are very easy to complete, even for those who don't enjoy crafting on a regular basis. Make sure your printer's ink cartridges are full, grab some glue and coloring supplies, and have fun creating memories to close out one year and begin another.